The Strategy is being developed through technical analysis of the transportation system, extensive outreach with Indigenous peoples and communities, and consultation with municipalities, stakeholders and the public. Phase 1 was an overall assessment of the region and started in May 2015. A draft regional assessment report was posted for public comment in spring 2016. Phase 2 was an analysis of the transportation system and began in June 2015. 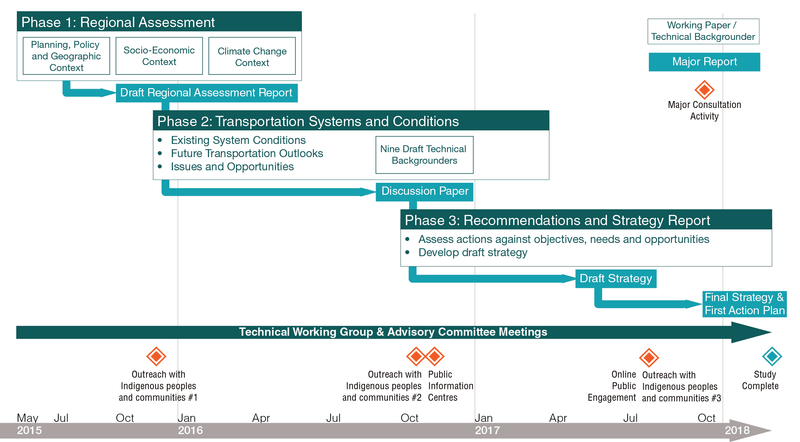 A discussion paper and a series of draft technical backgrounders that report on transportation systems analysis were posted for public input and comment in fall 2016. The final phase is the development of the Northern Ontario Multimodal Transportation Strategy. A draft Strategy was posted for public comment from July 12, 2017 to September 15, 2017. The ministry is currently reviewing all input that was received and is finalizing a final Strategy and first Action Plan, which are expected to be released in winter 2018. The first Action Plan will prioritize actions over the next 2-4 years, and it is anticipated that several action plans will be released over the life of the Strategy to implement its directions. Engagement opportunities included regional engagement sessions with Indigenous peoples and communities, private and public technical advisory committee sessions, technical working groups, public information centres and online engagement. For more information, please visit the Get Involved page.